"An objective, thorough and disciplined methodology employed to determine the most probable underlying causes of problems and undesired events within an organisation with the aim of formulating and agreeing corrective actions to at least mitigate if not eliminate those causes and so produce significant long term performance improvement." 2) Why complete Root Cause Analysis?. 3) QM&T approach to RCA. 4) Practical guide to carrying out an RCA. 5) RCA Tools & Techniques. 6) Look up table for completing an RCA. 9) 12 Pitfalls of RCA. Gemba is Japanese for the place where the problem has happened. Gembutsu is Japanese for the actual information. Consequently, gemba gembutsu is actual information obtained at the scene of the problem. 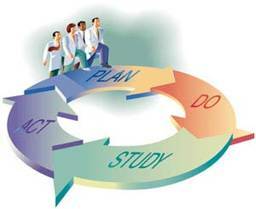 Therefore gemba gembutsu kaizen would be improvement established as a consequence of information from the problem scene. Much more practical details regarding Gemba Gembutsu and 5 Why's is provided in Vorley & Tickles book Quality Management (Tools & Techniques). 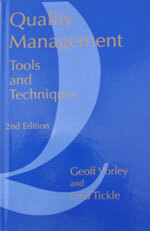 Free copy of the book Quality Management by Geoff Vorley & Fred Tickle provided for each course delegate. This book Quality Management (Tools and Techniques) is intended to provide quality professionals and students with a clear and comprehensive understanding of the tools and techniques of quality. 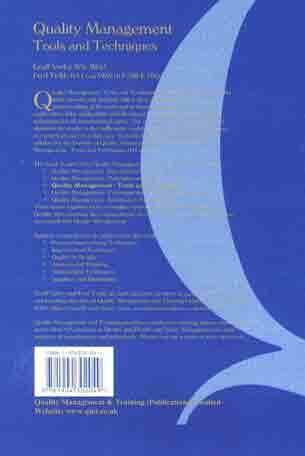 It delivers an exploration of the applicability and effectiveness of different quality tools and techniques for all organisational types. The intention being to encourage and stimulate the reader to feel sufficiently confident to use the tools and techniques in a practical and rewarding way. Quality Management (Tools and Techniques) is part of the Quality Management series which includes; Introduction to Quality, Quality Management (Principles and Practice) and Quality Management (Communications and Projects). For clarity and continuity purposes, there is correctly some overlap between these titles. However, this book is expected to be 'stand alone' and a comprehensive and practical reference to all the major quality management tools and techniques. provide a clear awareness and understanding of the disciplines, tools and techniques of quality improvement. enable the user to be capable of practical evaluation of the tools and techniques for variety of situations. enable the confident application of the appropriate quality tools and techniques for the selected activities in the business or organisation. Detailed below, is what could reasonably be expected to be appreciated and be competent in performing, as a consequence of studying this book. Demonstrate and present an argument for the use of the tools and techniques of quality improvement. Evaluate the applicability of tools and techniques of quality. Appropriately apply the quality tool or technique. Appraise the effectiveness of individual applications of the quality tool or technique. Analyse the contribution to quality improvement of the tools and techniques in a variety of organisational settings. Understand and develop the relationship between an organisation and its suppliers.